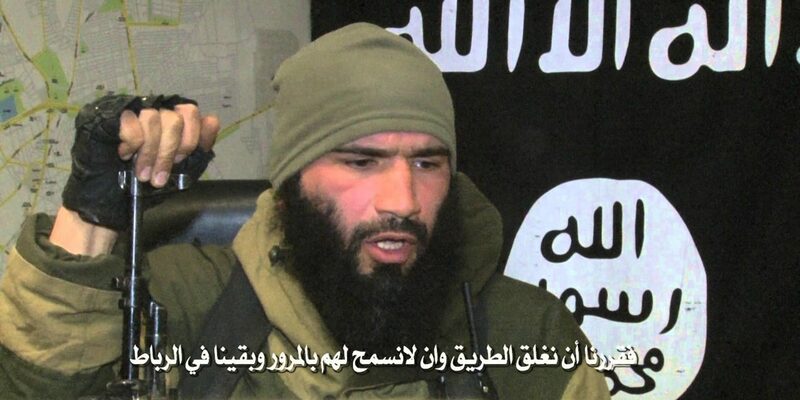 An American jihadi, Abu Mohammad al-Amriki, speaks about his move to the Islamic State of Iraq and ash-Sham from Jabhat al-Nusra, saying that he left JAN after its leader Abu Mohammad al-Jolani gave a green light to allow Jamal Ma’arouf and his Syria Revolutionaries Front to take weapons from the Turkish border. The address by Amriki sheds light onto several issues including the shifting alliances of foreign fighters between various factions; various attitudes of foreign fighters towards the battles between insurgents and ISIS; and control of weapons supplies smuggled via Turkey through the town of Atmeh on the Syrian-Turkish border. Amriki was a former comrade-in-arms of Sayfullakh Shishani, who joined Jabhat al-Nusra in December, and was seen in various videos with him. He says he had been living in the US for around 10 years when he heard about the “jihad in Syria”, so he travelled there with his family where he joined up with other foreign fighters, notably Sayfullakh Shishani, who — shortly before his death last week in the storming of the Aleppo Central Prison — had sworn allegiance to Jabhat al-Nusra. Amriki said he left Sayfullakh Shishani in January because of disagreements over events in Atmeh on the Turkish border, where the American was stationed. Amriki said that it was a “very big problem” for him and some of his comrades that the Free Syrian Army began to attack ISIS foreign fighters in Atmeh. Shortly after the fighting between ISIS and insurgents began, a Jabhat al-Nusra leader came and informed Amriki that Jamal Ma’arouf was coming to take weapons from al-Mukhayyim on the Turkish border, near Atmeh. According to Amriki, more than 20 of his men went to the checkpoint, also manned by Ahrar al-Sham, on the main road to Atmeh and closed it to wait for the convoy and its 60 vehicles. Its leaders told Amriki that they had been granted permission to enter Atmeh to get to the weapons cache. The convoy was refused premission, but the next day another convoy got through to the weapons on the border. This happened for a few days in a row, and Ahrar al-Sham were involved in the transport, Amriki said. The American said that he was informed later that the leader of Jabhat al-Nusra, Abu Mohammad al-Jolani, had personally insisted that the convoy should be allowed to take the weapons that came from Turkey via Atmeh. He and his comrades were very upset about the situation, Amriki said, because the weapons were being used against the Islamic State of Iraq and ash-Sham.